Drama. 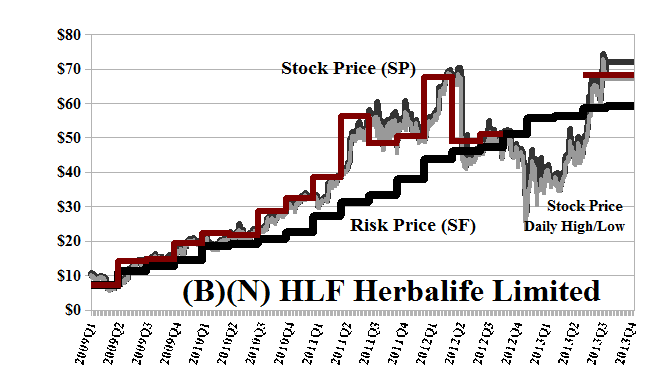 Our January Post on Herbalife deserves an update and solemn reflection on the nature of the capital markets. Having lost his socks on J.C. Penney, Mr. Ackman of Pershing Square Capital Management LP is now facing the “short-squeeze” of his life as the institutional investors line up against his position and, undoubtedly, have no intention of letting the stock price slip away from them (The Street, October 4, 2013, Bill Ackman Facing the ‘Herba-Squeeze’ of his Life). More than 50% of the common shares are now owned by just five institutional buyers (Carl C. Icahn (16%), FMR LLC (15%), Morgan Stanley (9%), Vanguard Group Incorporated (5%) and Soros Fund Management LLC (5%)) and the stock price has surged from the doldrums at $40 in January to the current $70 and rising. Moreover, the company’s sales and profits have been steadily increasing, and it plans to pay dividends of $124 million this year for a current yield of 1.8% which is another burden on the short sellers. Please see Exhibit 1 below. The price of risk has also increased from $52 in January to the current $60 and the stock is presently trading above the price of risk. Our estimate of the downside in the stock price due to the demonstrated volatility is minus ($12) per share and we can protect our current position with a stop/loss at $65 or buy the November put at $65 for $4 per share today and partially offset the cost of that with a sold call at $76 for $3.50 per share. We also note, in passing, that the price of risk resolves a Nash Equilibrium between “risk seeking” and “risk averse” investors and we often describe stock prices below the price of risk as “an excess of supply over demand” (N) and stock prices above the price of risk as “an excess of demand over supply” (B). Exactly. Now, we just need to do this for everybody, at the same time, and prove that we’ve done it. The solution (Goetze 2006) partitions any market into a part that behaves like a “risk-free” bond (B) and its complement that behaves like an equity (N). Herbalife Limited is a global nutrition company that sells weight management, healthy meals and snacks, sports and fitness, energy and targeted nutritional products as well as personal care products. From the Company: Herbalife Limited through its subsidiaries, produces and distributes weight management, healthy meals and snacks, sports and fitness, energy and targeted nutritional products, and personal care products worldwide. It offers science-based products in four principal categories, including weight management; targeted nutrition; energy, sports, and fitness; and outer nutrition. The weight management product portfolio includes meal replacement, protein shakes, drink mixes, weight loss enhancers, and healthy snacks. The targeted nutrition products comprise dietary and nutritional supplements containing quality herbs, vitamins, minerals, and other natural ingredients. The energy, sports, and fitness products consist of products designed to meet the nutritional needs of athletes, such as Herbalife24 product line, which enables athletes to customize their nutrition program based on personal training and competitive demands throughout the day. The outer nutrition products include skin cleansers, toners, moisturizers, facial masks, shampoos and conditioners, body-wash items, and a selection of fragrances for men and women, as well as anti-aging products. The company also sells literature and promotional materials, including International Business Packs, start-up kits, sales tools, and educational materials, as well as Internet based tools, such as BizWorks, a customizable retail Website for its distributors. Herbalife Ltd. offers its products through retail stores, sales representatives, sales officers, and independent service providers. The company was formerly known as WH Holdings (Cayman Islands) Ltd. and changed its name to Herbalife Ltd. in December 2004. The company was founded in 1980, has 6,000 employees, and is based in George Town, Cayman Islands.